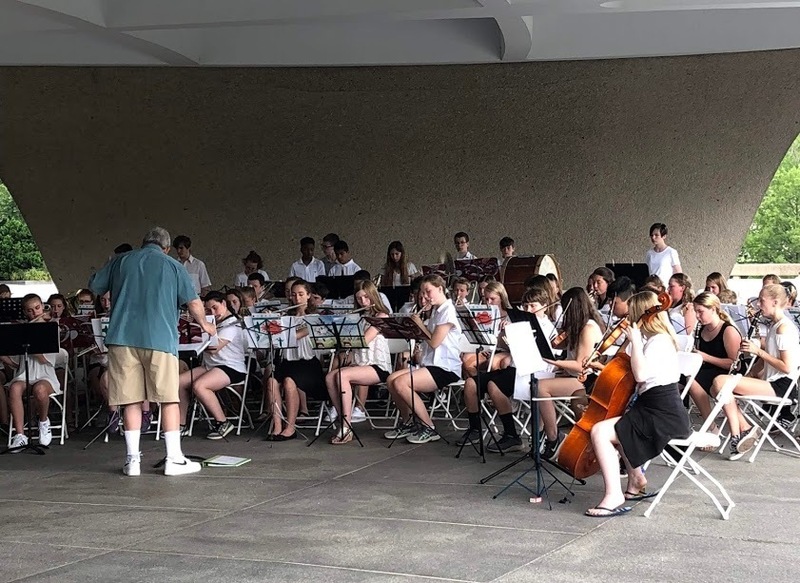 The Greater St. Albans Middle School Band (GSAMSB) performed a concert on Thursday morning, June 21, at the Hirshhorn/Smithsonian Museum of Modern Art. The museum is located on the National Mall in Washington, DC. 100 band students from St. Albans City, SATEC and Fairfield performed next to the fountain on the museum complex. A total of 200 people spent 4 days, June 20-23, in our nations capitol, visiting the Smithsonian Museums, seeing a Washington Nationals baseball game, attending a concert by the US Army Band on the US Capitol steps, and visiting the monuments and memorials around the city. This is the 14th concert and tour of Washington or New York City by the GSAMSB since 1991, under the direction of Frank Mehaffey. The band spent 7 hours in rehearsals on Saturday prior to performing at 10 am Thursday morning. The other music teachers in the district, Andrew Palumbo, Joanne Scott and the new band director at City School, Zachary Kelly, prepared the students for their concert. Thank-you to all involved!